Slow Cooker Hawaiian Chicken is sweet and smoky and slow cooked to perfection. 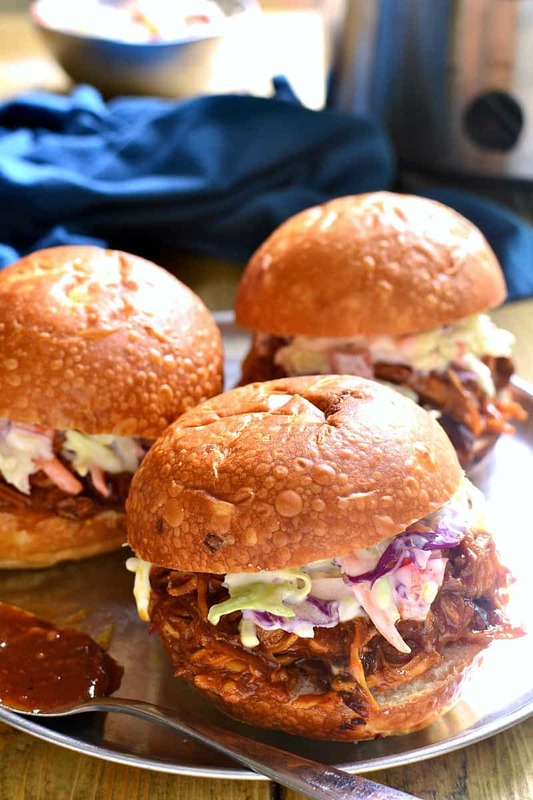 This easy slow cooker recipe makes a great sandwich, and is perfect for family dinners, parties, game day, or anytime you’re looking for something super easy & incredibly delicious! Anyone who has spent any time with our family knows that, when it comes to sister relationships, the one between Greta and Nora has always been a bit of a challenge. I’m not sure if it’s because they’re both middle children, or because Greta tends to be sensitive, or because Nora really can be difficult to deal with….but whatever the reason, their relationship is definitely on the rocky side. I can’t tell you the number of times I’ve talked to them about being nice to one another or worried about their feelings toward one another long term….and for the most part, it feels a little like talking to a wall. Because for the most part, nothing ever changes. But then, every so often, they do a 180 and everything is completely different. At least momentarily. This past weekend was one of those times. Ellia was gone on a Friday night sleepover, and since Myla goes to bed early, Greta and Nora only had each other. Of course, that can go one of two ways….but this time, at least, they decided to make the most of it. All weekend long they were playing together, coloring together, dressing as twins, eating the same foods, and referring to one another as “BFF” and “bestie”. To the point where I actually had to remind them not to leave Ellia out. And you know what? It made ALL the difference. Life felt so much more peaceful, so much more relaxed. And even though I’m sure it won’t last, I loved it while it did. And I’m sure it sounds silly, but one of the things I loved most about it (aside from the peace and quiet) was how easy it felt to get Nora to eat. Because she wanted whatever Greta was having….and Greta was loving this Slow Cooker Hawaiian Chicken. In fact, she was eating it by the bowlful all weekend long….which meant that Nora was, too. And I totally can’t blame them, because this Slow Cooker Hawaiian Chicken is AWESOME! It’s sweet and sticky and slow cooked to perfection. 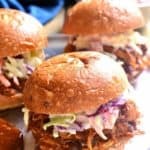 Undoubtedly the best pulled chicken sandwich I’ve had (and I love me some pulled chicken)! Of course, I’d be willing to share it ALL if it meant a more harmonious household. But…..I’m not holding my breath for that. But what we CAN hold our breath for is a week of slow cooker recipes! Because, in addition to my slow cooker Hawaiian chicken recipe, I’ve joined together with a few of my favorite bloggers to bring you the BEST slow cooker recipes you can enjoy all year round! 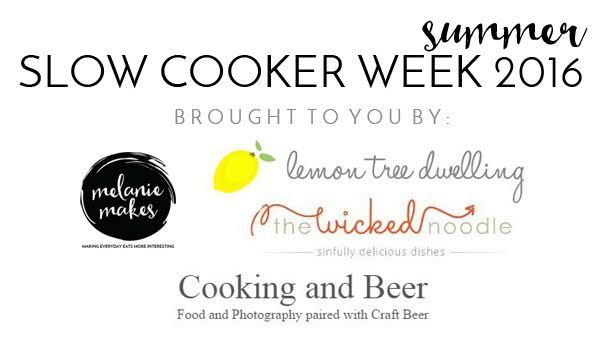 And, this is your lucky week, because you can enter to win your very own brand new slow cooker! Yippee!!!! 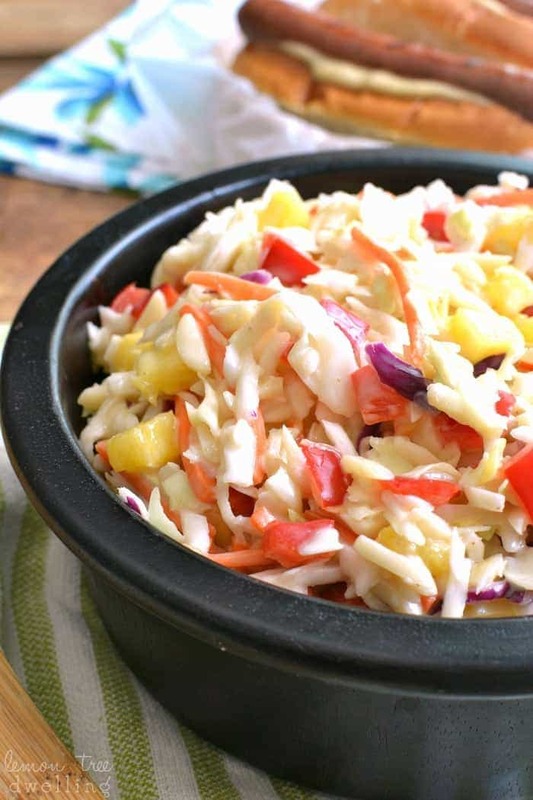 Be sure to whip up my Hawaiian Cole Slaw to serve with the sandwiches! This easy slow cooker Hawaiian chicken recipe could easily become your new summer recipe favorite! 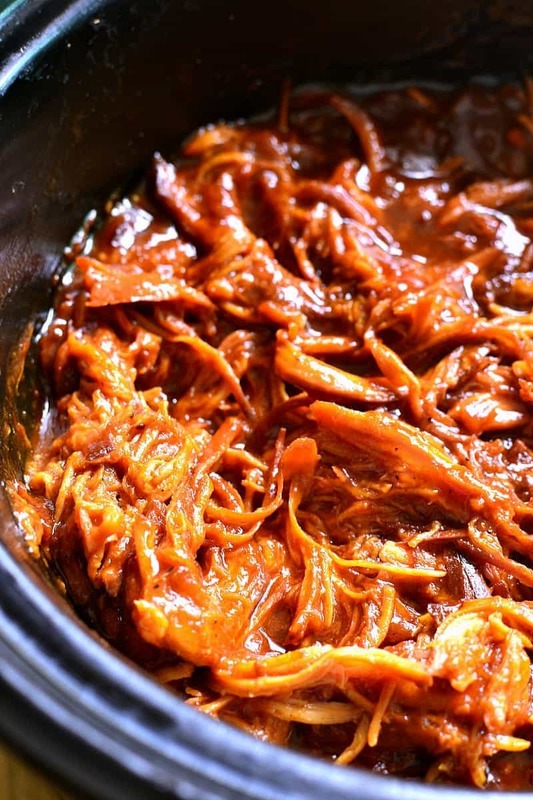 This Slow Cooker Hawaiian Chicken is sweet and smoky and slow cooked to perfection. It makes a great sandwich, and is perfect for family dinners, parties, game day, or anytime you're looking for something super easy & incredibly delicious! Combine pineapple juice, brown sugar, ketchup, soy sauce, garlic, worcestershire sauce, and spices in a large measuring cup or mixing bowl. Mix until all ingredients are incorporated; set aside. Heat 2 Tbsp. butter in a large skillet over medium-high heat. Add chopped onion and saute until onion begins to brown. Stir in 1/4 c. flour. Add pineapple juice mixture to the skillet with the butter, onion and flour. Bring to a boil. Boil, stirring, 10-15 minutes or until sauce is thick. Place chicken in slow cooker and cover with sauce. *If sauce is not as thick as you'd like it to be, you can prop open the lid and let some additional liquid evaporate before shredding and serving. *Note: sauce will thicken further as it cools. Based on readers' comments, I updated the recipe on 8/11/17 by increasing the cooking time on the sauce prior to adding it to the slow cooker. I’m always looking for easy dinners these days and hate using the oven. This looks like a win-win! Oh and siblings are tough! My 2 can play joyfully and also fight like crazy. Lots of “reminders” and hiding to let them work it out. Sisters!!!! If y’all would get all the ads off of the recipe , we could try it better. I used the leg & thighs as I’m not crazy for breast & thought the sauce was to thin. Going to make white rice & put the chicken on top & see how that is. Having it tonight for dinner. Taste great, however, think it could use a little more seasonings. Did you omit the flour? How can the sauce be thin? Just curious, did you try the recipe to rate it 5 stars? I look at the ratings to try to get thoughts on the recipes. I agree I get so frustrated with those darn adds. I’m more likely to purchase said items if they don’t show the ads ad pop ups over whatever I’m trying to read. I made this just as you directed, it is delicious! Moist, saucy and sweet. I’m planning on freezing it and taking it with me on a trip to see my kids. They’ll love it! Oh my gosh, Cathy, I NEED one of these sandwiches. It looks so good!! What a cute story about your girls! And who can blame them for wanting to eat this chicken all day long? It looks fantastic! Absolutely scrumptious! My family would devour this! OMG! You are making me hungry! This is my kind of sandwich! 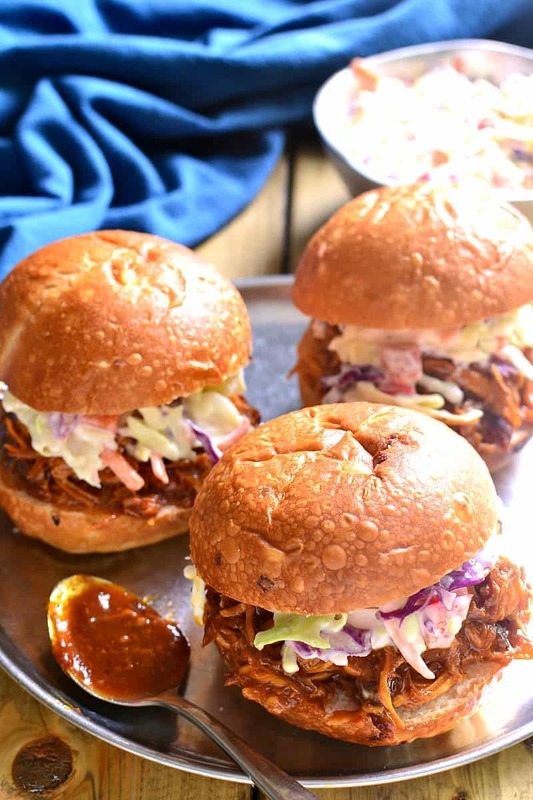 I love BBQ topped with coleslaw – totally my jam!! 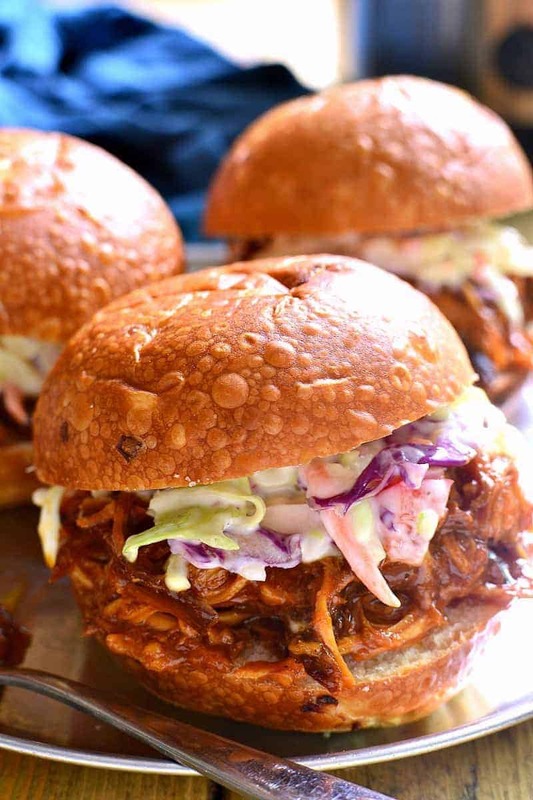 Slow cooker FTW – love the looks of theses amazing sandwiches! About how many servings does this make. Is the chicken frozen or thawed when you put it in the crockpot? Always when possible used fresh chicken breasts, slow cooker will break down the meat during cooking process and it will be fall apart tender! Frozen or thawed chicken in crockpot? Thank you!! I think I’m going to try this with a pork roast and not a loin roast, I want some dark flavor meat! Duman Dedektör Görünümlü Gizli Kamera : Özellikle yangın algılama sistemi bulunan yerlerde tercih edilir. How to make this without the crockpot? Hello, I am a Chef for a Sorority, there aren’t Crock Pots big enough for feeding that many girls…LOL…Follow all normal instructions, put your meat of choice into an oven safe pan and set your oven to Around 200F. Make sure it is wrapped tightly, throw into the oven and walk away for 6 hours and forget it (good Luck, the smell will make you crazy!) If it can be easily pulled apart at 6 hours, you’re done, if not…re-wrap tightly and continue cooking an additional 1-2 hours. HAVE FUN! GOOD LUCK! We are RVers and this is going with us next week to Hilton Head. Easy to make ahead and put in the fridge till you want to heat it! Looks amazing! Ok. I apologize. Just got it. More coffee……. I was wondering the same thing and I still haven’t figured it out. And I don’t drink coffee. Help. You mix together all the sauce ingredients, then cook it briefly to thicken before adding it to the crock pot with the raw chicken. I hope this answers your question! I want to make this for 45 people. Suggestion for how many times to multiply this recipe? Also, do you have a recipe for the Coleslaw? This recipe says it serves 12 so you have to extrapolate from there. If you want to serve 60, multiply by 5, for 120 by 10. I would think this would be a great recipe for a very large group. I just need to feed 3, but the leftovers will never be wasted at this house. Thanks for this recipe, Cathy….my men will love it, I’m sure and we will find out tomorrow. Do you pull the chicken apart after its cooked? Yes! You shred it just before serving. I think, I have not tried it, but, you could use peach juice. I used a peach mango mix juice and it was good. Their were no leftovers. I use a hand mixer to shred meat when it’s hot. So easy! This is amazing! So good! Thank you for the recipe! Has anyone tried this recipe? I have a party this weekend for around 20 people and want to try this, but afraid until I hear some reviews. Lots of comments but not from anyone that tried this recipe. Making this tonight. In the crock now. This is going on my menu for next week IMMEDIATELY! Can’t wait to try this! Cathy I was curious have you ever made the sauce the night before and then thrown everything in the crockpot the next morning? We are in the middle of travel soccer season so our weekend mornings are crazy and sometimes we leave the house as early as 4am. The less I have to do those mornings to ensure a hot meal when we get home the better. lol thanks and I’ve already made this once as instructed and with the slaw, absolutely amazing!!! I am curious about this as well!! of age hoսse. : RRB . I have this in my slow cooker right now, and let me tell you, the prep was a breeze (even before coffee), and my kitchen smells A-MAZ-ING! I can not WAIT until dinner tonight! I’m a bit pressed for time and wondering if I could cook for less time on high? What would you recommend? Thanks. Тhose of you who are middle-aged have no clue. The ginger that is called for in this recipe is it fresh ginger or ground ginger? If i want to cook it on High how long would i have to put it for? Do you think this would work okay with regular cooked shredded chicken (done previously in the slow cooker) and just add the sauce to it and heat it through? I quadrupled this recipe and made it for a large graduation party. It was a big hit! We served it with Kings Hawaiian rolls. Did you have to adjust the cooking time by quadrupling the recipe? How many hours? I made this as written, and I’m pretty handy in the kitchen. However, when chicken was finished in the crock (after 8 hours on low), the sauce was extremely thin (prolly from the chicken juices?). I am adding thickener and reducing it on the stove now to get that desirable stickiness, and will add it to the shredded chicken before throwing it under the broiler to crisp up a bit. Is the sauce always so thin? I’m contemplating just making a new batch of sauce, thickening it up and adding that to my chicken to get the best flavor. Thoughts of the event or events enter your mind less often. But they would say that they are right and you are wrong. serve further notice that it’s time to build the Temple. Just made this and my husband is eating it. Flavor is good and it is certainly easy. One thing I will note is that in order to get the sauce (which is tasty!) to stick to the chicken after you’ve shredded it, you REALLY need to reduce it to thicken it. Otherwise, it is runny and certainly wouldn’t stick to the chicken the way it shows in the picture. That might be a helpful instruction to include, along with the fact that you need to shred the chicken with 2 forks or whatever, since the recipe doesn’t specify that and some people may think you should cook it long enough until it falls apart, which I’m pretty sure it won’t do or if you cook it that long, it will be flavorless. I just bought one of those new Cuisinart slow cookers that has the added feature of being able to use it to saute. I was hesitant to buy it because of the cost compared to other slow cookers but so glad I did. I sauteed the onions right in the pot and then added the sauce ingredients and thickened them per the instructions. Then added the chicken and went swimming in our pool. After 6 hours, I took the chicken out, shredded it and put it in a serving dish. I turned the slow cooker back onto saute and let the sauce reduce by more than half until it was thick and sticky. Then I poured it over the shredded chicken and viola! It sticks to it. And I had no extra pots to wash, which is even better. Made the slaw, too. Nice accompaniment — think it needs a bit more flavor profile. Was a bit bland but might be my fault because I used Greek yogurt instead of mayo because this is not a house that is fond of mayo. Maybe it will taste better tomorrow after the flavors marry. I am not a mayo lover either. Lately I have been using a store bought bottled Poppy Seed dressing for my slaw. Mayo lover husband prefers the Poppy Seed. Big surprise there. Got a wonderful recipe using bagged slaw mix, cut up snow peas, Craisins, Poppy Seed dressing and topped with cashews. Made it for a group of golfers (guys) and had to send the recipe to them, as per their requests. My main dis for my mele kaliikimaka Christmas party this year! You did not mention the type of rolls you used. This was very good. Definitely a keeper. Be sure to make the coleslaw too. They really complemented each other. Where is the recipe for the coleslaw? Really good recipe. Be sure to make the coleslaw too. They really complement each other. Tried this for a community party and it was a huge success. Could you add the recipe for the coleslaw, please? My daughter (15) made this. The sauce was super thin. Maybe she didn’t cook it long enough. It is good but VERY sweet. I think it is too “pineapply”. If the sauce was thin, it was most likely not cooked long enough. It was stated you can thicken the sauce some more. I made this today and it was so yummy! In case people were wondering, I cooked on high for 4 hours and the chicken was fully cooked and fell apart. I shredded it and cooked on low for an additional hour to thicken it up a little more and soak up more flavor. It came out perfect! So if you’re in a crunch, you can cut the time in half by cooking on high for 4 hours. Making this for the first time as we speak…. Will the sauce be okay overnight in the fridge?? Or will it thicken too much?? This looked like it would be so good, but was WAYYYY too sweet. If I make this again I’d have to tinker with the recipe a bit. Sorry to hear that. Feel free to use less sugar! Do you know how to convert this for IP? I assume you would make the sauce on the sauté setting, but do you need to add liquid? How long to cook on what setting? QR or NPR? I would also like to know about a possible Instant Pot conversion for this recipe. It looks great, but with fall sports for kids, I need to be able to have it done quicker, if possible. I’m sorry…I don’t have experience with Instant Pot. Hopefully someone else can chime in!! So happy to hear that….thank you for letting me know! Can it be reheated and how? Is the coleslaw on this regular coleslaw, or is it the Hawaiian coleslaw that was above the recipe? Has anyone made this with Orange Juice instead of pineapple? I have a child who is allergic to pineapple, but this sounds so yummy! Orange juice would work well! I am definitely going to make this for a weekend gathering. We have tons of family and this would be a great comfort food dinner on a Saturday. Homemade rools and your Hawaiian Chicken are going to be the stars. Thank you for the idea. Is there any way to speed up the process. Or maybe make the sauce the night before and mix all together in the morning? something is missing in the flavor of the chicken sauce for me. making the coleslaw and hoping the combination pulls it together. otherwise I like the recipe and it is easy! from the excitement of the recipie! 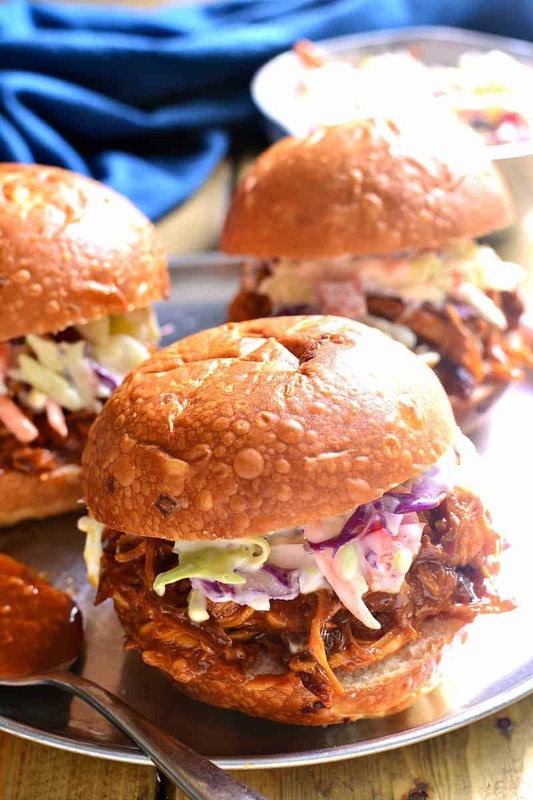 This recipe is definitely a good starting point for a great pulled chicken. I read through all the reviews and went to work. I agree with one person that said she was going to use chicken thighs, I think boneless, skinless breasts get too dry so I will add a mix next time. I added more flour at the beginning hoping it would help thicken it up a bit more in the end, but it didn’t. I cooked it the full 8 hours and in the end still felt it needed a bit more flavor. I added some (about 1/2 cup) crushed pineapple and about 1/2 of a mango habanero BBQ sauce I had on hand. I didn’t have time to cook the sauce down any so it was very messy. I served it with the Hawaiian coleslaw which was great! Could you send me the recipe you used for the Hawaiian slaw? Thanks so much!! I cooked this as written and at the 6 hour mark, my chicken was burnt. It was on low. Sad that this didn’t work out for us and that I had to make another plan for dinner. What type of buns were used? What about the cole slaw how do you make that? What is your recipe for the slaw? Looks great! I’m about to make the chicken now for the first time. Is there anything I can substitute for the pineapple juice? My sister is allergic to apples, pineapples, cherries, and oranges. I got up early to make this recipe for dinner later today. I was completely stumped as your instructions were incomplete. Your recipe requires making two sauces, one from catsup and spices, etc. and the other from onions and pineapple juice thickened with flour. Then you simply state to cover the chicken with the sauce. Which sauce? Was the 1st mixture that was set aside to be added at some point to the onion mixture? Please edit your recipe carefully before publishing, as it can be very confusing. i will edit my rating later based on how it turns out, but for now, the recipe itself only gets one star and that is for the fact that it sounds appealing. So sorry the instructions seemed incomplete. I re-read them and all the steps were included. I’ve tried to make them more clear for next time. I love this recipe! I’ve used it at least a dozen times and its a huge hit! I have a slightly larger party this weekend, about 35… Can I make this in a big pot on low heat? So sorry I never got back to you on this! Did you decide to try it? I’d love to hear how it went. Some of the comments say 6 hours on low and the instructions say 8 hours. How much time is needed on low? It will depend on your crock pot….6-8 hours on low is the typical range. Could you do this in an Instant pot? I’ve done it in the crock pot and love it. Would you make an adjustments? I have made this numerous times and everyone loves it. Making it now to take to a friend who broke her arm. 5stars!